The apricot is a small fruit with velvety, golden to orange colored skin, orange flesh and a hard seed or stone at the center. It is about the size of a plum. The fresh fruit tastes smooth and sweet, with a flavor that is a cross between a peach and a plum. An apricot in its raw state is somewhat acidic. As it ripens the acidity decreases, the sugar content increases and the vitamin A content doubles. Apricots are crammed with nutrients. The fresh fruit is rich in easily-digestible natural sugars, vitamins A and C, riboflavin (B2) and niacin (B3). Apricots are an excellent source of minerals like calcium, phosphorus, iron and traces of sodium, sulphur, manganese, cobalt and bromine. Apricots are often dried, cooked into pastry or eaten as jam. The calories in apricots multiply many times over when dried, but the amount of calcium, phosphorus and iron also increase significantly. The beta-carotene and lycopene in this golden fruit help protect the LDL cholesterol from oxidation, which in turn helps prevent heart disease. The hard apricot seed coat is rich in protein and fat like any other nuts. It has an extremely high content of vitamin B17 which is known as Laetrile. Daily consumption of this seed is claimed to be highly effective in preventing cancer. Cancer patients on Laetrile Cancer Therapy have reported that their tumors have shrunk with high doses of vitamin B17. These bitter seeds may be chopped up or ground and swallowed with a teaspoon of honey. Related reading: How to eat apricot seeds (vitamin B17 or laetrile) for cancer treatment and cure chronic diseases. Inside the hard seed coat is the softer apricot kernel. Apricot kernel oil and apricot flowers have been used in medicine and medical treatment since ancient times. The kernel yields an oil similar to that of the almond and is widely used as a sedative, anti-spasmodic relief to strained muscles. It is also useful for healing of wounds, expelling worms and as a general health tonic. Apricots help with anemia: The high content of iron in apricot makes it an excellent food for anemia sufferers. The small but essential amount of copper in the fruit makes the iron available to the body. Liberal consumption of apricot can increase the production of hemoglobin in the body. This is ideal for women after their menstrual cycle, especially those with heavy flow. Apricots help prevent constipation: The cellulose and pectin content in apricot is a gentle laxative and are effective in the treatment of constipation. The insoluble cellulose acts as a roughage which helps the bowel movement. The pectin absorbs and retains water, thereby increasing bulk to stools, aiding in smooth bowel movement. Apricots can aid digestion: Eating an apricot before your meal will aid digestion, as it has an alkaline reaction in the digestive system. Eat apricots to maintain healthy eyesight and good vision: The high amount of vitamin A (especially when dried) is essential to maintain healthy eyesight. Lack of vitamin A can cause night blindness and impair vision. Apricots can ease fever symptoms: Blend honey and apricot with mineral water and drink to cool down fever. It quenches the thirst and effectively eliminates the waste products from the body. Apricot leaves can ease many skin problem: Apply fresh apricot leaves and apply on scabies, eczema, sun-burn or skin itchiness for a cool, soothing feeling. Did you know? Umeboshi, the alkaline forming, stomach calming, Japanese plums are actually apricots. They are taken to aid digestion, fight stomach bacteria and detoxify the liver. Apricots are usually picked when they are still firm, so that they ripen when they reach the stores or your home. An unripe apricot is often yellow and hard. When ripe and soft, its color turns into a consistent golden-orange hue. Handle the fruit with care as it is easily squashed or bruised. Stored in the fridge, apricots will remain fresh and last longer—up to three or four days. When overripe, the fruit turns soft and mushy. Apricots can be sun-dried. You will need to cut them in half, remove the seeds and place them in the sun. Naturally dried apricots will turn brown. Many store bought non-organic apricots are treated with sulphur dioxide before drying to prevent oxidation—this helps maintain the orange color, but should be avoided as they are harmful. In the Mediterranean, the apricot seed is used to make a tasty liquor. TIP: the apricot seed kernel can be eaten and is highly nutritious. Break open the hard outer seed coat, and remove the inner white kernel. It can be eaten raw or toasted and enjoyed with salad. When are apricots in season? In temperate climates, apricots come into season from mid-May to early summer. Like most fruit and vegetables provided by mother nature, the best time to consume is when they come in to season in your area. This is when your body is likely to crave and benefit the most from their nutrients and healing properties. Fresh apricots contain a small amount of oxalates. Individuals with a history of calcium oxalate-containing kidney stones should not consume too much of this fruit. Non-organic dried apricots contain sulfur-containing compounds such as sulfur dioxide. These compounds may cause adverse reactions in asthma sufferers and should be avoided. Can I juice an apricot? 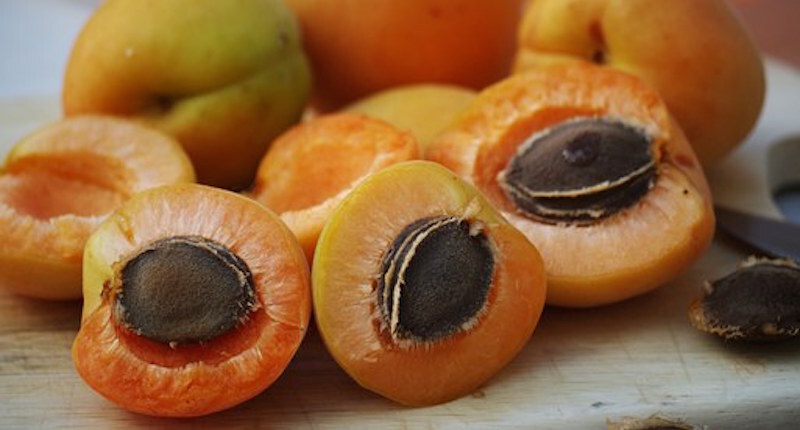 Apricots are not suitable for juicing but can be blended and then mixed with other juices.